This is a sponsored post written by me on behalf of Friendship Dairies. All opinions are 100% mine. Are you meal prepping or looking for easy ways to incorporate more protein in your diet? Maybe you are getting sick of the same old chicken breast and broccoli and need something fun; yet easy to throw into the mix? Besides boiled eggs, one of my favorite and tasty ways to increase my protein intake is by eating cottage cheese. 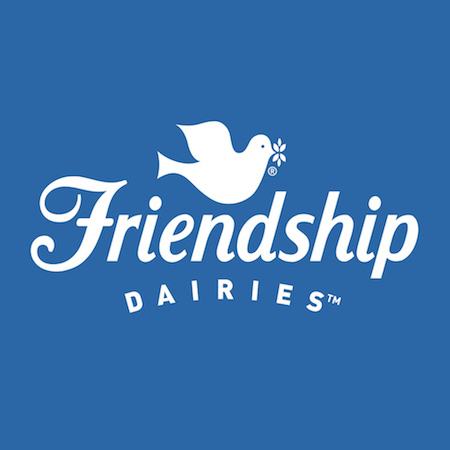 I particularly love the Friendship Dairies brand because it is creamier than the competition, and they have a low salt option. Seriously you guys, Friendship Dairies cottage cheese is awesome! I buy mine at my local grocer and always look for the pink or red container to spot it easily. It is priced right, and I will even buy a few extra tubs of it for week night meals like meatless stuffed shells. Today’s recipe for an easy Tropical Cottage Cheese Parfait really fuels my fancy because it can serve as a meal or dessert. 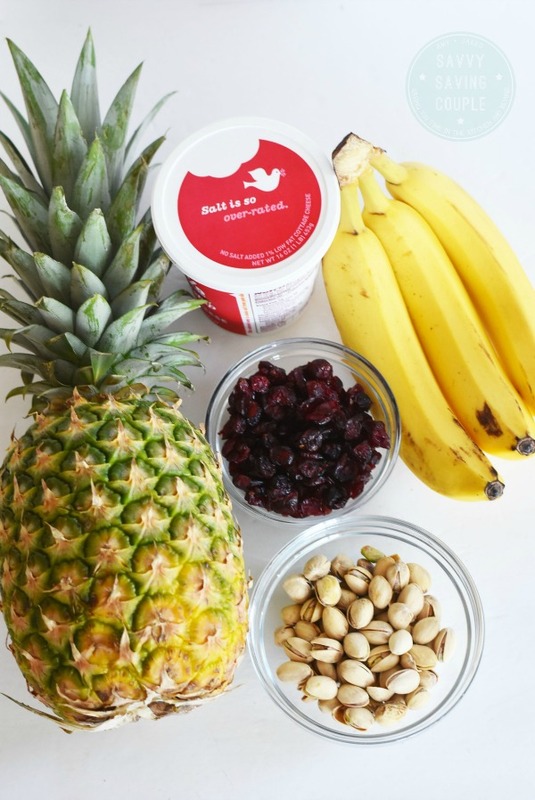 The combination of fresh and juicy pineapple, dried cranberries, fresh banana and crunchy pistachios pair wonderfully making it an easy, yet tasty choice to fuel your body. Speaking of fueling my body, have you ever checked out the Superfood Generator app on Friendship Dairies official site? This cool generator allows you to see how much protein your next cottage cheese bowl will boast! Plus, you can get some pretty cool ideas for fresh mix-ins to make your next snack or meal a hit! Did you know that you can also get some amazing recipes from bloggers like myself on their site? Get inspired with smoothie ideas, sweet treats like pancakes, and more! There are protein-packed recipes for every taste all in one neat place! 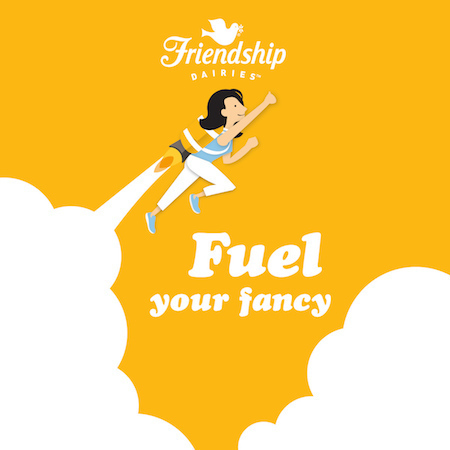 Plus, you can share what fuels Your Fancy! 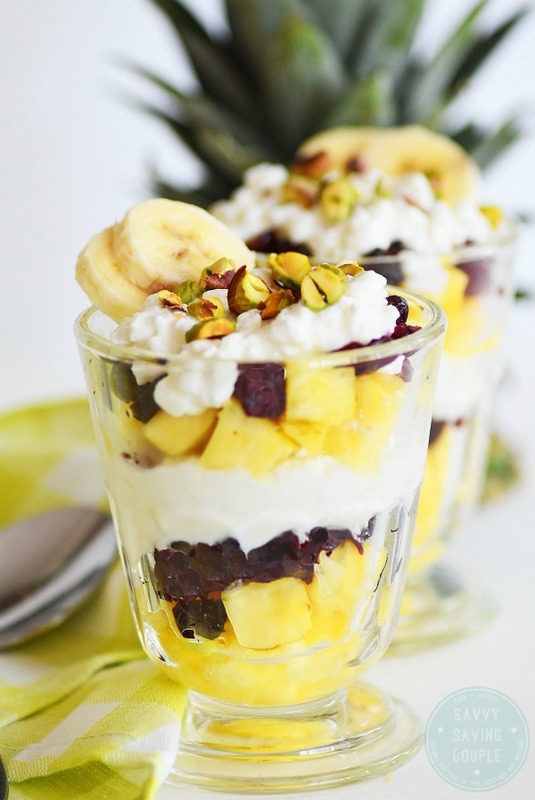 Doesn’t this Tropical Cottage Cheese Parfait look so tasty? I assure you it can be easily recreated too! The most time-consuming aspect was cutting up the pineapple chunks which can be done ahead of time for the week! Simply layer each component for a fresh snack that even my kids are loving! 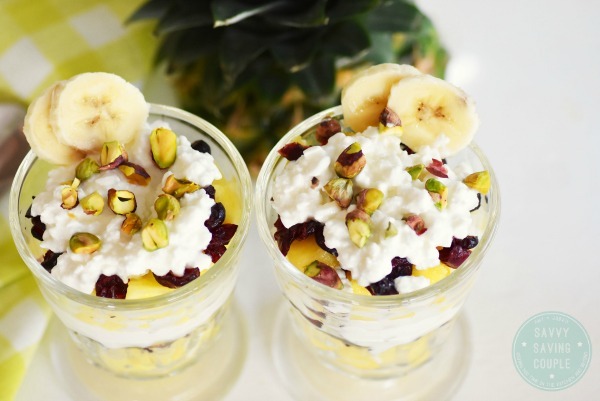 To make this Tropical Cottage Cheese Parfait, the easiest thing to do would be to prep your ingredients ahead of time. If you plan on making this for the entire week (you just might after you taste it) placing your ingredients (sans banana) in containers will make it easier. I shelled my pistachios ahead of time, and chunked ups my fresh pineapple. When assembling, start with a layer of pineapple, cranberries, and cottage cheese, and alternate twice. Top with fresh banana and pistachios for a nice crunch! Friendship Dairies wants to know what makes you, YOU! Do you like to sing in the shower, hang out at the beach, or mountain climb? Be sure to tag them on social media with hashtag #FuelYourFancy and show them what makes YOU unique! So, now that you see my protein-packed Tropical Cottage Cheese Parfait, what kind of recipe would you create with Friendship Dairies cottage cheese, The Original Superfood? We want to hear all about it below! That sounds so good. 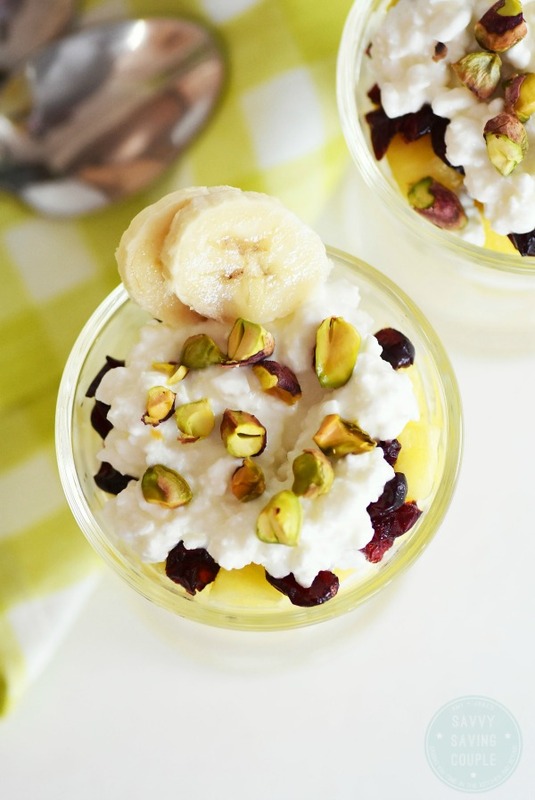 I love parfaits like this in the mornings and this sounds like a great way to start the day. That looks great! It is healthy and yummy all at the same time! I need to make something like this for a great healthy snack. This would be a great party appetizer. Just what I was looking for – thanks! I love cottage cheese. My favorite fruits to have with it are apples/applesauce, also peaches or pears. Did you save me one?! Oh that looks amazing. I love all of the ingredients and will definitely have to try it! That parfait looks amazing! I’ll have to make some of these soon. I think this would be a great dessert for after dinner. I can’t wait to try them out. What a colorful and yummy dish for summer! My boys would love this. Parfaits are great: They’re yummy, good for you and they look awesome. And the pineapple makes yours turn into a great summer treat! I am always looking for new ways to enjoy Cottage Cheese. I will have to get the ingredients i need to make this on the weekend. It looks so delicious. Any time I eat pineapple I feel like I’m on vacation! This looks like a great way to celebrate the yummiest flavors of the season. My daughter is obsessed with eating cottage cheese and peaches. I will have to surprise her one day with this delicious treat! 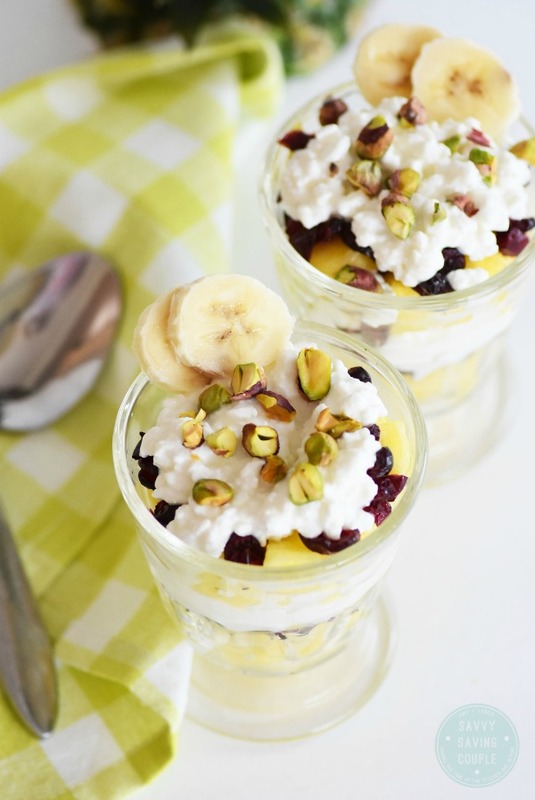 Parfaits are an amazing way to pack in some seriously nutritious flavor combos. The Cottage cheese in the parfait is a true inspiration. This looks so good!! 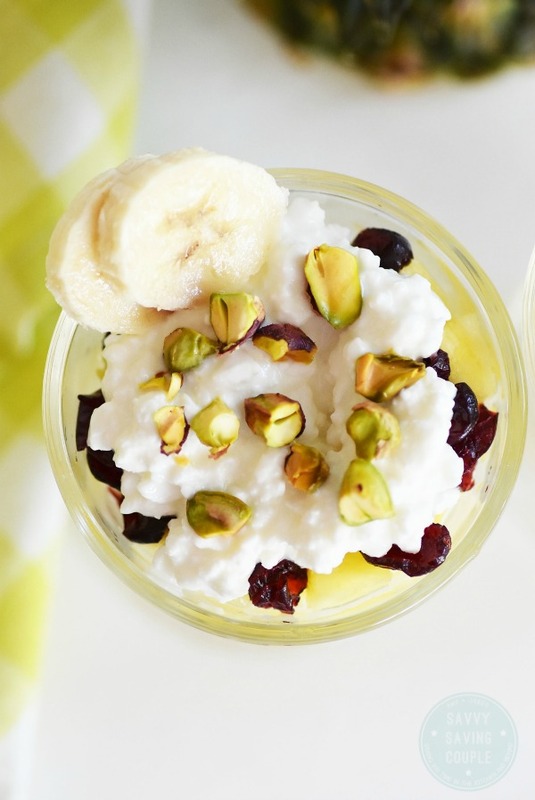 I never thought to make a parfait with cottage cheese instead of yogurt what a great idea! You don’t even know how much I love cottage cheese! This is 100% up my alley and especially since it’s tropical.